Who want’s a super easy make ahead Thanksgiving dinner side dish? Steam the carrots for 10 minutes or until they are just cooked through. Spread them out on a sheet pan and allow to cool for about 30 minutes. In a large mixing bowl, combine the mango chutney and brown sugar. Add the cooled carrots and mix thoroughly but gently, so you don’t break up the carrots. 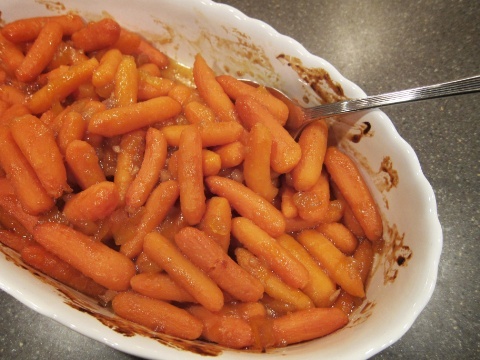 Place the carrots into a baking dish and wrap with plastic wrap until time to heat them up for dinner. – Mash the carrots before mixing with chutney; add 1/4 cream. – If you can’t find chutney, try orange marmalade with a teaspoon of ground/fresh ginger. – If you can’t abide packaged baby carrots then by all-means peel and cut about 10 fresh carrots into 2 inch batons for that super homemade look; steaming time should be adjusted by about 5 or so minutes less. – Why not try mixing in some Parsnips too!